Linear (or Longitudinal) timecode (LTC) is an encoding of SMPTE timecode data in an audio signal. The process of feeding LTC into the audio channel of a camera from external sources (such as timecode devices), is often used for cameras that either cannot handle external TC sync and/or do not provide proper timecode to the recorded clips. It offers the possibility to include such cameras in a workflow that requires synchronous timecode. The timecode data existing in internal audio tracks of video clips can be extracted in Silverstack and Silverstack Lab to be applied to the metadata of the video clip. This enables subsequent processes that leverage timecode, such as e.g. providing detailed clip metadata for editing, transcoding clips with embedded timecode metadata, creating detailed clip reports or automatic audio sync based on timecode. 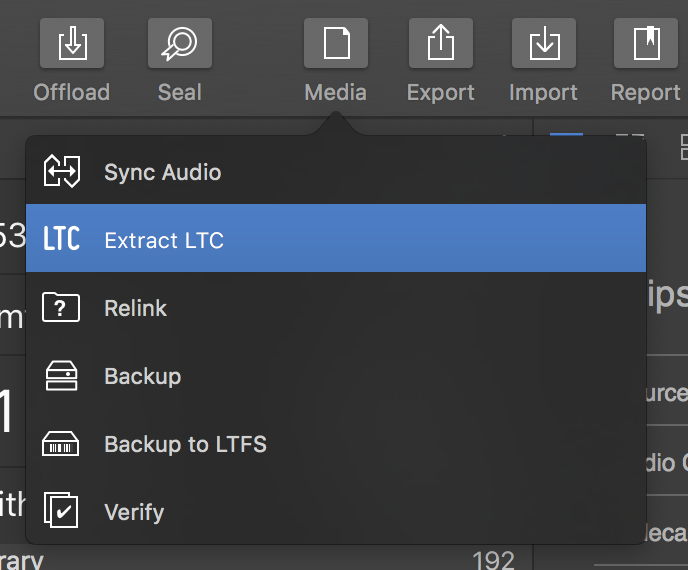 To extract LTC in Silverstack first make sure to ingest all clips with LTC into the Silverstack library. Silverstack attempts to read the LTC at the beginning of a clip. If no LTC is found the application iterates into the clip’s timespan in several steps searching for an LTC in the whole clip. This also indicates that an LTC only has to exist for the beginning of a clip to be read out properly. 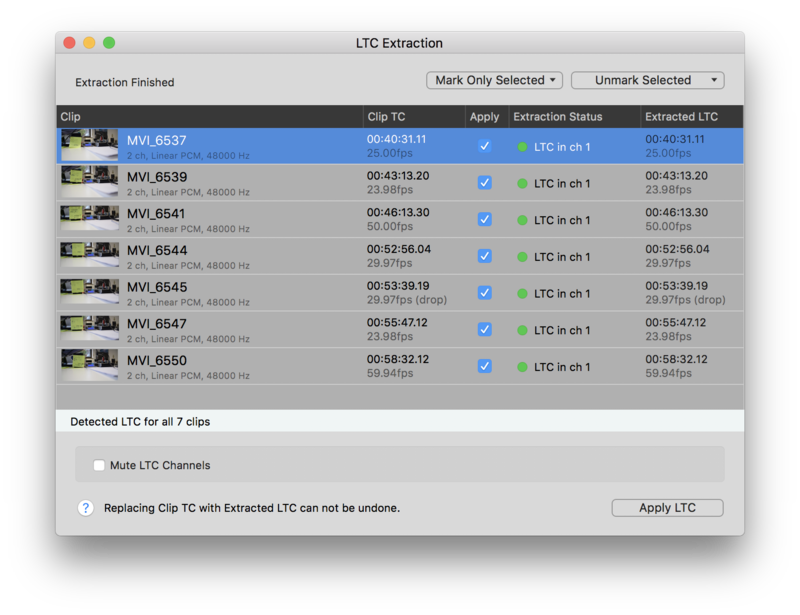 By checking the “Mute LTC Channels” checkbox you can make sure that after applying the LTC timecode to the clips the channels with LTC will become muted in Silverstack. Click “Apply TC” to replace the Clip TC with the extracted LTC. Please be aware that the process of applying the extracted LTC to the clip is not reversible and cannot be undone. Once you have taken over the extracted LTC to the clip you cannot go back to the original TC from the clip. Now the timecode can be used for all subsequent task that involve the need of timecode for clips like e.g. transcoding or automatic audio sync based on timecode.
. Learn more about it in the article How to Automatically Sync Audio based on Timecode in Silverstack Lab. “No LTC track found”: No LTC track was found for the clip. Check the clips audio in the audio tab of the “Audio&Color” panel. “Type mismatch”: The fps of the LTC do not fit the LTC of the clip and the clip TC can therefore not be calculated correctly. This could especially become a problem with certain DSLR camera types that display 24fps as user selection in the menu but record in 23.976fps. Make sure clip TC and LTC match for a proper extraction. “Clip offline”: Clip is offline. 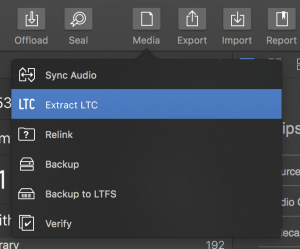 Bring clips online to extract LTC. “Extraction error”: An unknown extraction error occurred. “Clip has no audio”: The clip has no audio. Check the clips audio in the audio tab of the “Audio&Color” panel. Please be aware that LTC in the audio track does usually not survive compressed codecs such as e.g. MP3. As the drop flag only affects the way of counting timecode and not its actual speed it is possible to apply drop-frame LTC on non-drop clips and vice versa. As the bounds of an image frame are not necessarily the bounds of an LTC-audio frame, an error of up to a half frame can accumulate when synchronizing audio to LTC.